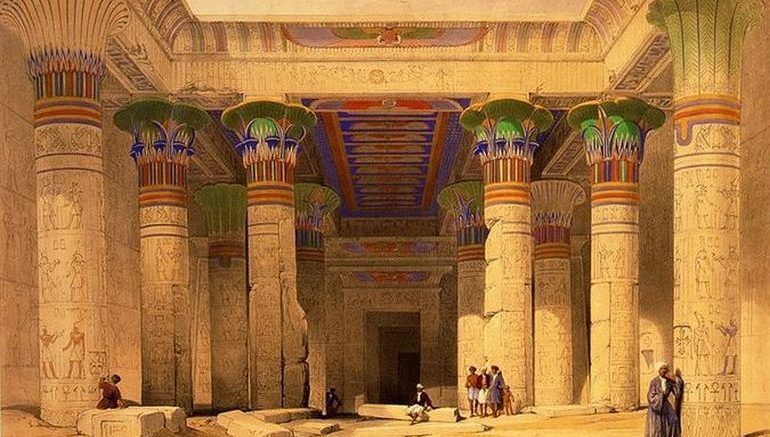 Philae Temple – painting by David Roberts 1838. Often thought of as the last active refuge of the native ancient Egyptian religion, the island temple complex of Philae (or Pilak, meaning ‘the end’ or ‘boundary’) was originally located near the massive First Cataract of the Nile in Upper Egypt. Probably comprising two islands, the conglomerate site of Philae (1,500 by 490 ft) was mythically related to the burial place of god Osiris – thus making it an important pilgrimage center for both Egyptians and the Nubians. Building upon this ambit of reverence, the later Egyptians, Greeks (Ptolemaic dynasty) and even Romans furnished their fair share of architectural features – which collectively translated to the magnificent ancient Egyptian island temple complex of Philae. It should be noted that presently the Philae complex is not situated in its original location, with the proximate areas being flooded by the Aswan Low Dam in 1902. Fortunately, by virtue of the ambitious 9-year long UNESCO Nubia Campaign project in 1970 (before the construction of Aswan High Dam), the temple complex was dismantled stone-by-stone and reassembled precisely in its current location – the nearby Agilkia Island that most resembles its ancient counterpart. However, going down the history lane, in the following animation, the resourceful folks over at Altair4 Multimedia have reconstructed the sheer scale and size of the original Philae, along with the vibrant recreation of the interior of the main Temple of Isis. The oldest remnants of the Temple of Philae harks back to the ancient Egyptian 25th dynasty, also known as the Nubian Dynasty (circa 8th century BC), with the remains corresponding to a chapel dedicated to Goddess Isis. During the following centuries, many of the Pharaohs maintained their military garrisons on the island, probably due to the strategic location of the site. Pertaining to the latter scope, the islands at Philae were actually centers of commerce, and as such were one of the major river trading posts/access points connecting Meroe (in Nubia) and Memphis (in Egypt). Additionally, the proximate areas boasted granite quarries that rather attracted colonies of miners and stonemasons. In any case, the site once again returned to religious significance during the reign of the native Egyptian ruler Nectanebo I (circa 380-362 BC), with the inauguration of the Temple of Hathor and the present colonnade. 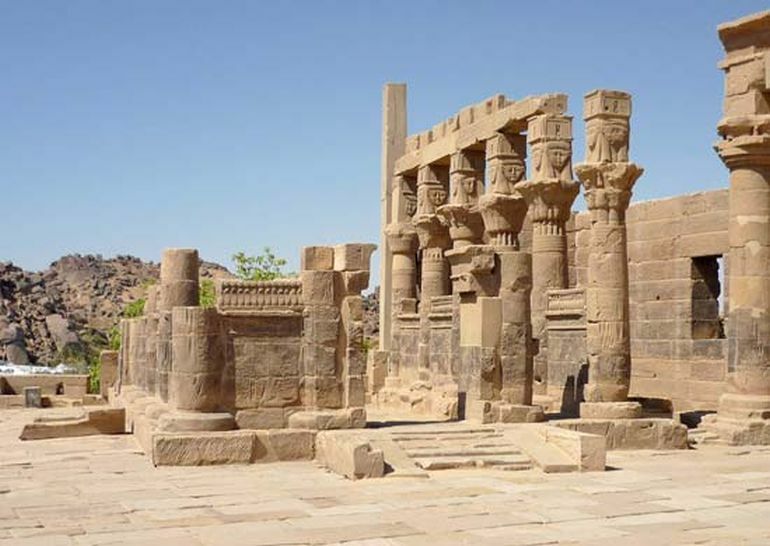 However, the greatest architectural projects at the Philae site were arguably conceived (and refurbished) during the Ptolemaic period, with the primary candidate entailing the grandiosely built Temple of Isis (which occupies a quarter of the new island). The construction of this main complex started during the reign of King Ptolemy II, while his successors went on adding and extending the monumental segments of the temple. Interestingly enough, in spite of their Greek origins, the Ptolemaic kings were conscious of the ancient Egyptian heritage in the area – so much so that the majority of the Temple of Isis was built in the same style as the Temples of the New Kingdom (dating from circa 16th – 11th century BC). Quite intriguingly, during the Ptolemaic period, the religious undertone associated with Philae rather a more puritanical route. To that end, the island temple complex was a perceived as a forbidden zone for regular civilians, in spite of trickles of pilgrims who made their way to visit the legendary burial place of God Osiris. 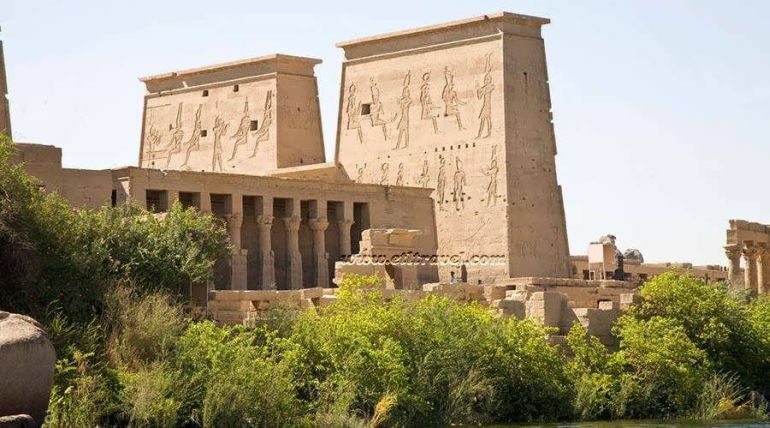 In 2nd century BC, the priests residing within the confines of Philae even petitioned Ptolemy VIII Physcon to stop visitors from approaching the island and living there at their expense. 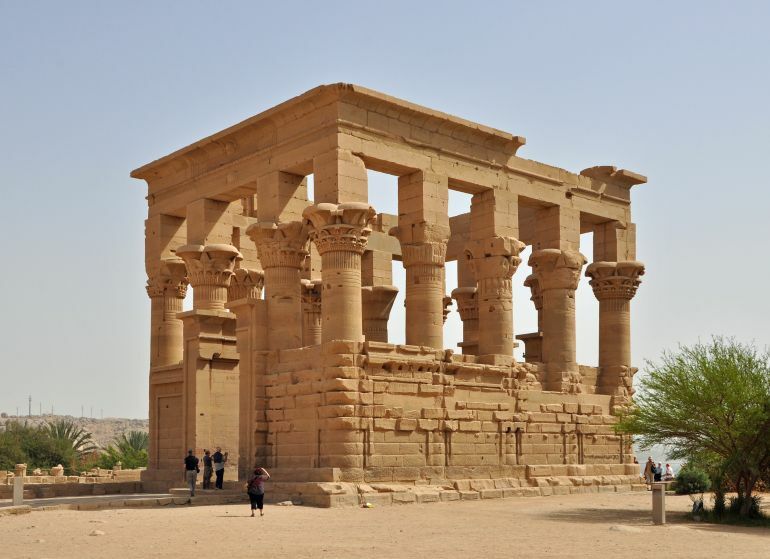 In the early centuries of the Roman Empire, the site of the Philae complex continued to thrive, with decorative elements being added to the Temple of Isis during the reign of both Augustus and Tiberius. Under Emperor Hadrian’s patronage, a monumental gate was furnished for the western facade of the complex. This was complemented by a few smaller temples and shrines dedicated to Hathor and even Imhotep, along with chapels of Osiris and Horus. The later Roman period also brought forth elements of Christianity to Egypt. During this epoch, many of the early proponents of the faith identified the parallels between the stories of Jesus and Horus. This fascinating scope possibly led to a uniquely syncretic religious system where many of the chapels of Horus were repurposed into makeshift churches. In any case, the Temple of Isis was officially closed and converted into a church on the orders of the Eastern Roman Emperor Justinian I (527–565 AD). This episode was accompanied by the construction of two other Coptic churches in the vicinity, thus symbolically heralding the end of the native Egyptian religious ambit of Philae. Lastly, in case one is interested in the current status of the Philae complex situated at the Agilkia Island, take a gander at the video below, courtesy of traveler Igor Tochilnikov.